I've installed ESRS VE 3.32 and I'm having difficulty getting past the network checks. The ESRS VE box sits in our network with a private IP address which is NAT'ed via a firewall to the outside. Originally I tried using a proxy to route out (proxy's north of said FW) but this didn't work (I ensured TLS wasn't changed). 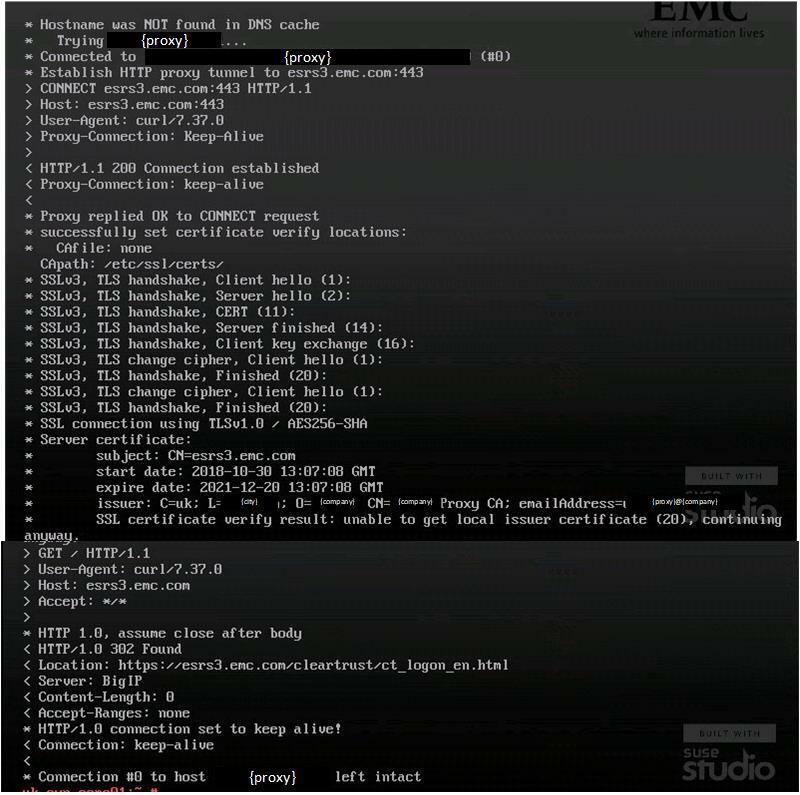 I've then bypassed the proxy so that only the FW is between the ESRS VE and Dell/Emc, but to no avail. The FW shows both SYN and SYN-ACK coming back, but according to the server it's failing all tests. It states ESRS is NAT friendly, but I'm starting to worry that's not correct. Has anyone got this working through a NAT'ed (not transparent) install. if these two work (the second will probably end in a SSL handshake failure, but SSL handshake will at least be started), please follow fix 1 in KB article 503235 to be able to skip the network check. There will be an option in the GUI to skip the network check in a future version, unfortunately not in 3.32 yet. If provisioning does not work, indicating a real issue with the network connectivity, please open a SR with support to get assistance. Thanks for your help. There was an issue with the firewall that's been fixed (wrong IP) and now CURL direct is getting a timeout. This is the CURL output via the proxy.